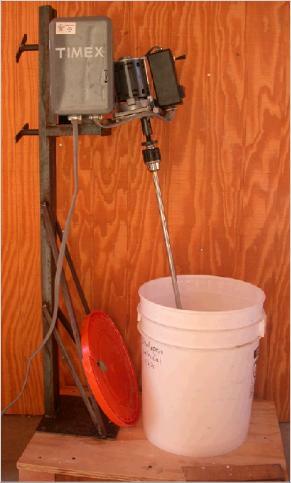 A slurry mixer is used in the ceramic shell process to prevent the slurry from settling and hardening. Industrial mixers have a tank that contains 30 to 50 gallons of slurry and cost several thousand dollars. On a busy month I might cast a couple of sculptures - hardly enough to justify the upkeep of an industrial unit. I did use the Shellspen system, and found it to work quite well, but the lifespan of shellspen once it is mixed is only about two months. After this time the slurry starts to settle and neeeds to be mixed before each dip. I decided to build a small slurry mixer for 5 gallon batches. 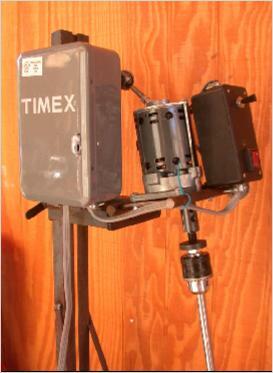 I was able to get a 1/20 hp, 300 rpm inline gear motor and a timer online from Surplus Center. A motor shaft arbor allowed me to mount a chuck onto the motor. I made a propeller from some 16 guage stainless sheet and welded it to a 1/2" stainless steel shaft. The rest of the assembly is welded from angle iron. The tank in just a 5 gallon homer bucket. The white one you see in the pictures is just screwed to the base to hold a second bucket with the slurry which is placed into it. The whole mixer cost me under $75. Update: The mixer worked fine for about a year, but then the timer broke. One of the nylon teeth inside broke off and I went and purchased a good electronic timer from Grainger (a Paragon EJW percentage timer, Grainger #6XZ66, about $110). More then doubled the cost of the mixer, but I was tired of coming in and finding the slurry settled and hard. Then the little motor I got stripped a gear, so for another $75 I got a nice 250 rpm, 1/10 hp Bodine motor on ebay (new about $300) - worth it just because it's sooooo quiet! Much beefier, metal gears, etc. As of this writting, there are some still available by the seller. I also purchased a small 4" cast aluminum propeller from McMaster Carr - #3502K122 - for $15. It was too small so I enlarged the propeller with wax sheet and sand-cast a larger one-maybe 7" diameter. It works great. The first one I did was bronze (it's what I was casting that day), and seemed to create an electrolytic reaction with the steel setscrews. Got huge domes of rust/silica over the screws and the bronze started to disappear - the crystal structure of the blades really shows! I've just cast an aluminum one and replaced the setscrews with stainless ones. We'll see how that works. I also plan to make a fiberglass slurry tub that is more conical in shape. It's a pain dipping larger work in a 5 gal homer pail! The upshot: I've now spent around $275 on the mixer, not to mention a bit of work. Worth it? To me, yes...but i love making tools! Besides, as I said above, there is nothing on the market this size. Here is a picture of the mixer. The assembly with the timer, motor, and switches can be slid up and down by loosening the two handles on the left. The white bucket is screwed onto the wood base. 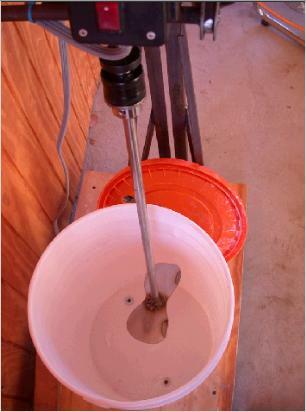 A second bucket, with the slurry in it, fits inside the white bucket. The lid has a hole cut in it for the shaft with two flaps made from duct tape to help keep the moisture in. This is a detail of the motor/timer assembly. You can see the motor shaft arbor and chuck attached to the motor. A detail of the motor/timer assembly from the other side. 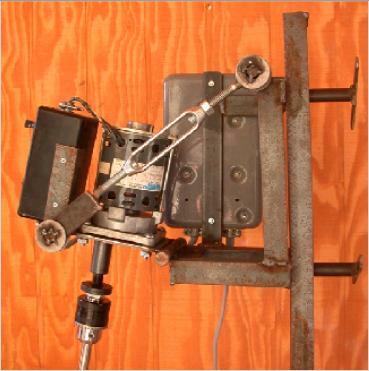 The motor is attached to a plate that is hinged so the angle of the shaft can be changed. I did this because I wasn't sure what angle would be best for mixing the slurry. This is a view showing the propellor. The two welds on the right side of the prop are for balancing it. You can also see that the white bucket is screwed into the board with a couple of drywall screws and some washers. Another bucket with the sllurry fits into this one and can be removed and stored when not in use.